Wed., March 9, 2016, 11:14 a.m.
KANSAS CITY, Mo. – A Mexican national suspected of killing his neighbor and three other men at his neighbor’s Kansas home before killing another man about 170 miles away in Missouri was arrested early Wednesday, authorities said. Pablo Antonio Serrano-Vitorino was captured without resisting shortly before 12:30 a.m. Wednesday following a manhunt. He was found hiding face-down in a ditch about two or three miles from the scene of the last killing, which happened Tuesday morning at a rural home near the small community of New Florence, Missouri, said Lt. Paul Reinsch of the Missouri State Highway Patrol. He had a rifle with him, he said. “He looked exhausted,” patrol Sgt. James Hedrick told the Kansas City Star. Serrano-Vitorino, who has been living in Kansas City, Kansas, was caught shortly after someone called the authorities to report that he had fled from an armed man who had approached him, the patrol said. Serrano Vitorino is in the country illegally, U.S. Immigration and Customs Enforcement said in a statement. He was deported from the U.S. in April 2004 and illegally re-entered the country on an unknown date. ICE said it would place a detainer on Serrano-Vitorino. Authorities allege that Serrano-Vitorino gunned down his neighbor, 41-year-old Michael Capps, and three other men at Capps’ home late Monday before fleeing, leading to a manhunt. Authorities publicly identified them Wednesday as 36-year-old Jeremy Waters, of Kansas’ Miami County, and Austin Harter, 29, and Clint Harter, 27. It wasn’t immediately known whether the Harters were related. Authorities believe Serrano-Vitorino killed 49-year-old Randy Nordman on Tuesday morning at Nordman’s rural home near New Florence, which is about 70 miles west of St. Louis along Interstate 70, which connects Kansas City and St. Louis. A truck that Serrano-Vitorino was believed to be driving was found abandoned around 7 a.m. Tuesday along the interstate. 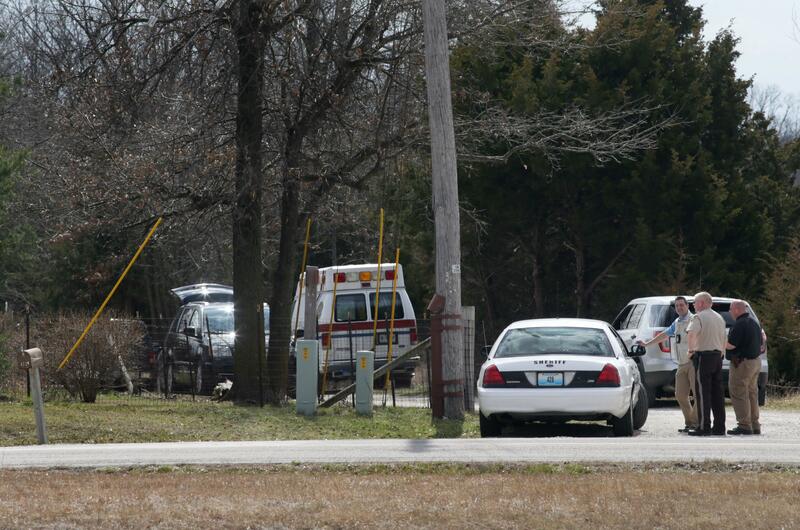 About 25 minutes later, sheriff’s deputies responded to a shooting about 5 miles away at Nordman’s property. Reinsch said a witness called 911 to report seeing a man running from the property, leading to a search of the thickly-wooded surrounding area. Serrano-Vitorino has been charged with four counts of first-degree murder in the Kansas killings, Wyandotte County District Attorney Jerome Gorman said. He had not been charged in Nordman’s killing as of Wednesday morning. He was being held Wednesday in a Montgomery County, Missouri, jail on $2 million bond linked to Kansas charges. Neither the county sheriff nor county prosecutor immediately responded to calls seeking comment. Authorities haven’t discussed a motive for any of the killings. Before dying, one of the Kansas City victims managed to call police, but it’s unclear how the men knew each other or what may have prompted the shootings, Kansas City police officer Thomas Tomasic said. Reinsch has said that investigators weren’t aware of any connection between Serrano-Vitorino and Nordman, whose home is near his family’s campground and a racetrack for remote-controlled cars. Published: March 9, 2016, 11:14 a.m.